You try on an amazing leather jacket. You fall in love. You think, “this is everything.” Then you look at the price tag. Your heart skips a beat. “Do I buy it?” Heart beats faster. Takes deep breath. You slowly… very slowly… place the jacket back on the rack. Tear rolls down cheek. You walk away. Giving that beautiful leather jacket a little #sideeye while you wipe tear. You drive back home contemplating life. Go to sleep. Jacket in dreams. Go back to store. Repeat. Raise your hand if this is you. Every weekend. Waves both hands in air. I get it. Leather jackets aren’t cheap. But every girl, deep down inside, wants one. No matter what their style is. They add instant cool. The kind of cool you see on Insta fashionistas. 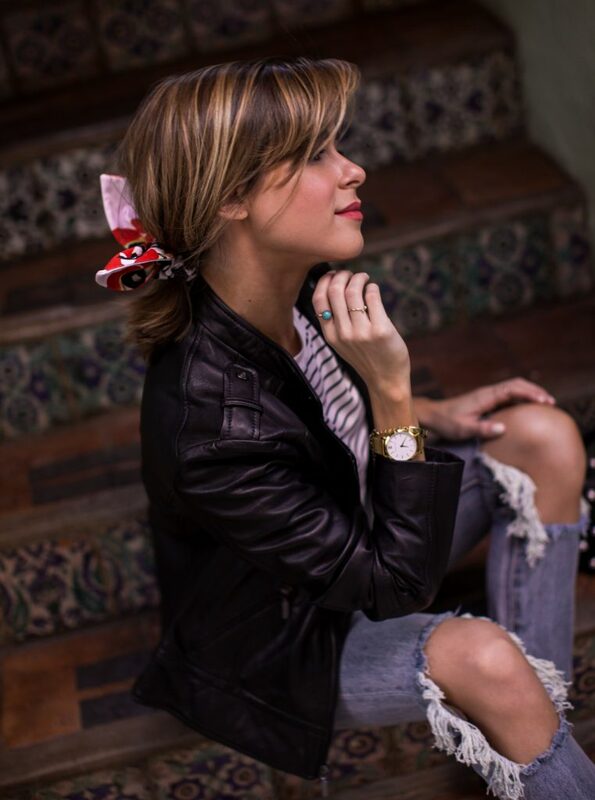 I first discovered Bernardo last September (click here to see post) and have since, worn that beautiful tan leather jacket so much. When I travel. To dinner when it cools down in South Florida. Draped over a floral maxi dress. You name it. I’ve worn it. Having been such a fan of that jacket, I needed another one. But in black. Hence today’s look. So if you’re willing to invest in one, I promise you won’t regret it. It’s a justifiable purchase. 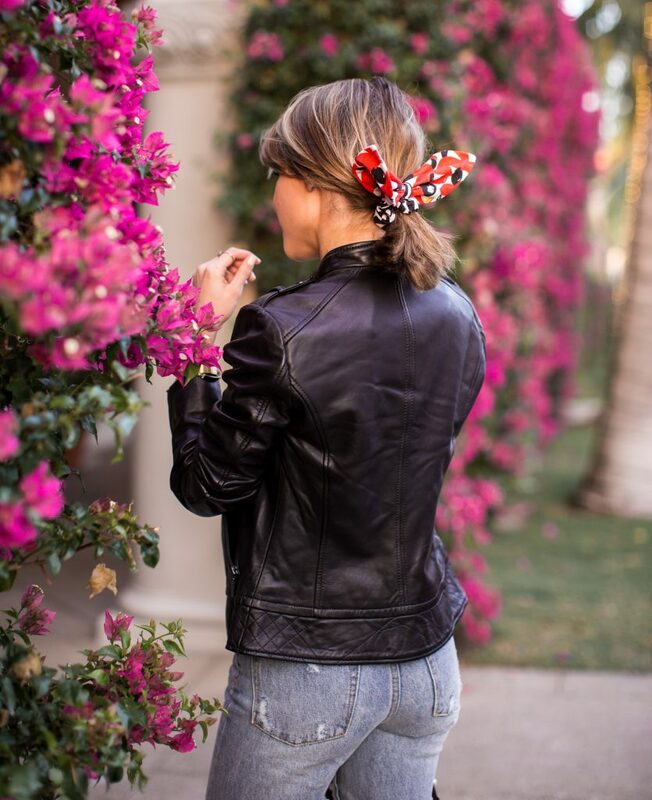 Leather jackets last forever. (Pretty sure my mom has one in her closet from the early 90s) You’ll wear it a ton. Think: causal t-shirts. With ladylike dresses. All white. With stripes. 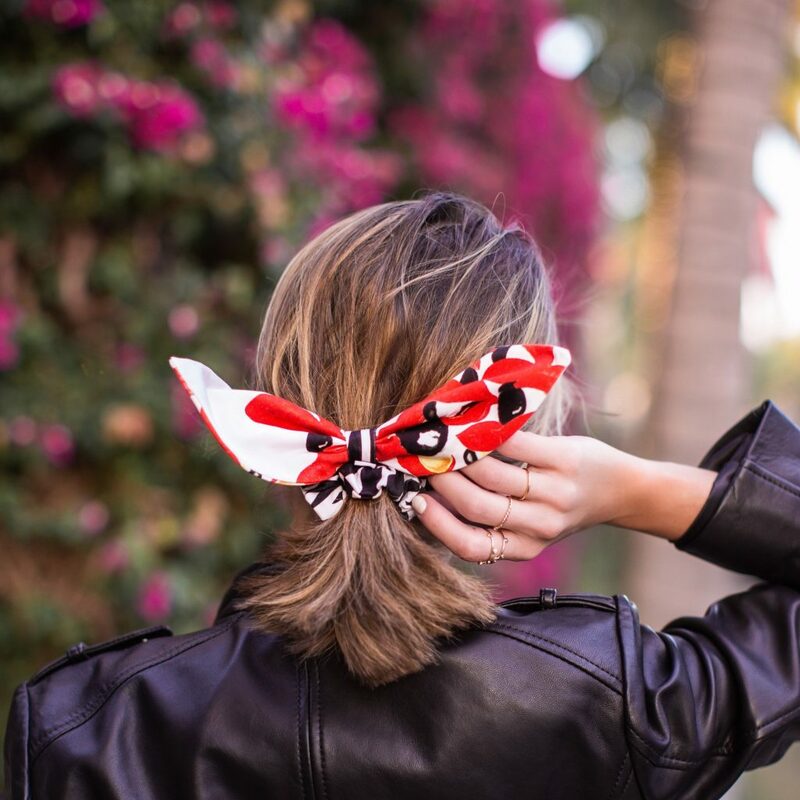 A bow in your hair (yes, scrunchies are making a comeback this year). Pretty much anything you can think of that needs a cool layering piece. It’s a staple. And truly timeless. And totally send a subliminal message to others that you’re super cool. 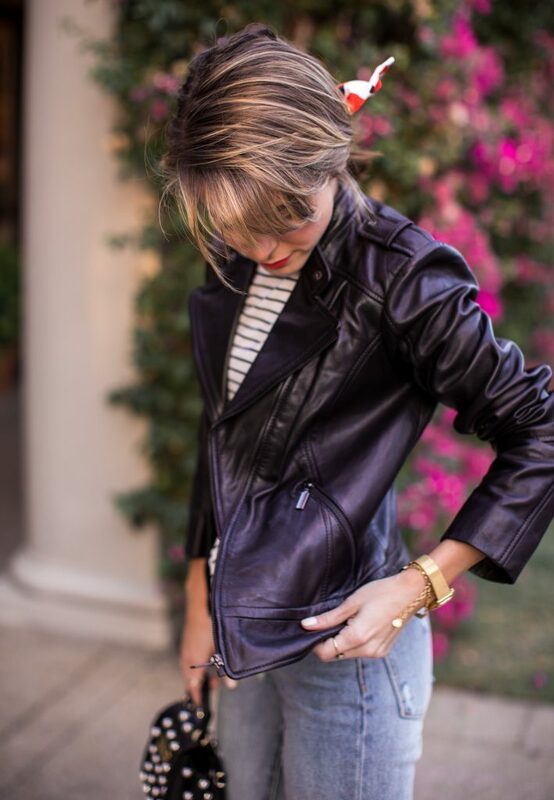 Shop today’s look from Bernardo by clicking the pink links above or below (for more leather jacket options from Bernardo)! Happy FriYAY everyone. I just had to pin some of these images. I am obsessed with that hair scarf! Looking so fierce in that leather jacket. Love the bow for a feminine touch! Obsessed with this effortless but Insta-cool look! That jacket is everything!